Using the default auto fan-curve I get 67°C with open side-panel and 69°C with closed side-panel. The GPU fans spin at around 50% at this point. GPU clock at constant 1995 MHz. Curiously most of the heat seems to point upwards instead of outwards, despite the heat-sink's fin orientation. Keep in mind that at this low CPU/VRM load my case fans only spin below 500 rpm (4x push/pull on intake CPU AIO radiator + 1x rear). Temps looks really good. Also your case cooling is quite good as it gets only 2 degrees warmer. Apparently my temps are similar to yours. Which I agree are fine. But with max power at 2025mhz I got up to 69c with Superstition. The air-flow might be just equally bad, because at higher GPU fan-speeds the difference between panel on and off is bigger. There even is insulation material on the side panels (bitumen + fabric) to keep noise down. It helps to use an AIO for the CPU, though, even with the radiator heat blowing into the case. Running Prime 95 Small FFT along-side does not make any difference, even with the radiator/case-fans spinning up towards 1000-1300 rpm then. Overall there is plenty of empty space in there, which likely matters most. At 100% fan-speed (3300 rpm) and open panel the temps stay at 53°C with constant 2025 MHz and 39-40 fps. If more of the smoke is placed in the view then clocks dip down to 2010. 80% (2650 rpm) can keep the clocks and fps mostly the same, but temps increase towards 57°C. Even with auto-fan curve and temps rising towards 69°C with a closed side-panel frame-rates stay around 39 fps, so it all doesn't matter too much in practice. I tested this all at a position with 740 materials, 23 light-sources, around 9.1 - 9.3 m triangles and some of the smoke being visible. On a side note: Removing the 280 mm fan-window from the side-panel (or the whole panel) has much less of an impact than it had before with my GTX 780 GHz Edition. With the latter card removing the window would easily lower temps by 10°C. That's likely because the old card blew more hot air towards the side-panel and then pulled the same air back in again, while the Asus Dual blows more hot air upwards and thus away from its own fan intakes. Last edited by Timur Born; 03-21-2019 at 02:56 AM. I have some very interesting results! I have done some more testing with the TDP of the EVGA RTX 2060 XC with a higher OC. Superposition is quite TDP hungry benchmark, so it is very important to have TDP of your card at max levels. Or is it? At 113% TDP and max OC, this small card struggles to dissipate more heat that it is designed to do, it gets at max 78C during benchmark. 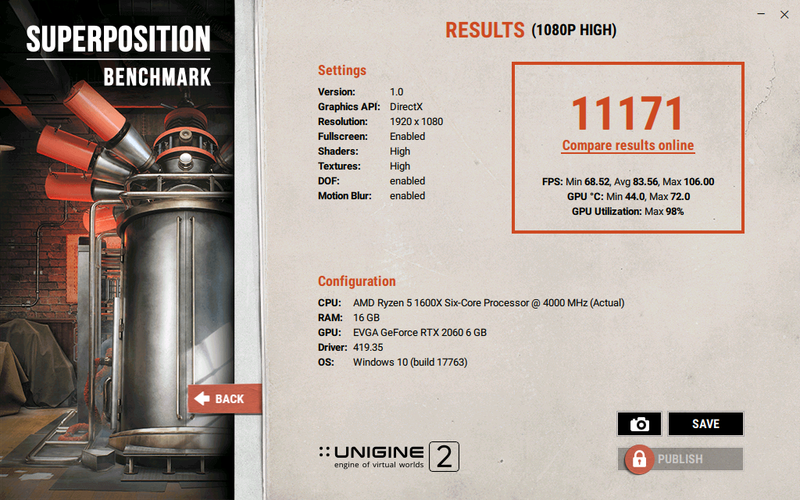 Meanwhile with 95% TDP and same OC, this card scores very close as with 113% TDP while running at 72C max. At stocks speeds with all stock setting it scores way lower and runs max 73C. So you can increase card's performance by OC while reducing TDP. This gives some extremely efficient results from what I saw in my tests. And this should be the max performance reduction by lowering TDP as Superposition is very TDP heavy. I am quite surprised by this! That is interesting, so basically what I glean from this is that upping the power limit does nothing but add heat, maybe a tiny bit more performance. With 113% TDP, +125 core +1000 mem, during bench ------------------- 185W - 195W, Score 11381. With 95% TDP + OC curve with undervolt + 1000 mem, during bench - 150W - 160W, Score 11227. I need to test this with others benchmarks. If it's stable, it's basically gold! Wow not bad. Is that 1000mhz mem oc +250 on the slider? That always confuses me. No curve, no undervolting, just changing the power limit slider. Last edited by Timur Born; 03-23-2019 at 03:26 PM. +1000 on the silder, from 7000Mhz to 8000Mhz. And what's your stock score? Because it's a very important baseline. Yes, I came back to using the manual slider for the core, no oc curve and undervolt. It wasn't stable in other benchmarks and too much messing around. So now I use +117 core, +1000 mem, 95% TDP, stock fan, max temp 71C (22c room), Score 11187. Stable in 10+ games+benchmarks. I will stick with this for now. 10428 at stock settings, side-panel open, 161W max. The Asus Dual already comes GPU overclocked at stock, though, does it not? Notice how at 120% power limit I measured less than 9% more power draw? The OC Scanner in Asus GPU Tweak II only allows 110% power limit so maybe anyting higher than that is not applied anyway. On the other hand GPU utilization maxes out at 97-98% with the 1080 "High" test, while D3D maxes out at 100%. So the GPU is not fully loaded during the benchmark. Last edited by Timur Born; 03-25-2019 at 06:26 AM. I ran 1080 "Extreme" at 100% vs 120% power limit using the same overclock values. Peak power draw was 12% higher at 120% limit, GPU load was 99%. Score difference was only 2% at 100% fan-speed and open side-panel. So realistically there seems to be only little benefit in upping the power limit.